Inverlochy Castle has the slightly sad air of a building overtaken by history not once, but twice. On the first occasion it was made redundant as the military focus of the area by the building of a wooden citadel at the nearby head of Loch Linnhe by Cromwell's forces in 1654. The more permanent fortress built on the site of this citadel in 1690 was named Fort William after the King, and the settlement that grew around, though originally called Maryburgh, later took the same name as the fort. And then in 1863 Inverlochy Castle saw even its ownership of its name challenged when its then owner, William Frederick Scarlett, the 3rd Lord Abinger, built a new, Scots baronial style, Inverlochy Castle a short distance north, in Torlundy. 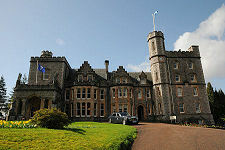 What is now Inverlochy Castle Hotel describes itself as "Scotland's finest luxury hotel", a claim unlikely to be challenged by anyone who has had the pleasure of staying. But perhaps Inverlochy Castle has an occasional laugh at the expense of both. The Old Fort in Fort William was largely destroyed by the coming of the railway to the town in 1894, the line of which was then built over again by the dual carriageway that runs down the side of Loch Linnhe. If you wander out to the edge of the loch from the roundabout at the north end of the dual carriageway you can still see the walls of the Old Fort facing out onto the loch; but not much else remains. Inverlochy Castle, though hardly in pristine condition, has comprehensively outlasted the usurper that replaced it. And while some of the brown tourist signs pointing you to the Castle from the main road north of Fort William refer to "Old" Inverlochy Castle, presumably to avoid confusion, others do not. Inverlochy Castle must have seen more than one bemused visitor turn up wondering whether this ruin really was their five star luxury hotel, before coming rapidly to the conclusion that it was not. Inverlochy Castle can be found just to the west of the A82 a short distance north of Fort William. If you are coming from Fort William and get as far as the roundabout at the Mallaig turning, you have gone too far. It is signposted from the A82 and you reach it by crossing a wooden bridge over the outflow of water previously used to generate hydro power for the nearby aluminium works. Beyond the bridge is a layby offering a few parking spaces. The castle is set in a small area of parkland. What you find is a surprisingly complete, though obviously ruined, castle. To the north the River Lochy curves lazily round en route to Loch Linnhe, crossed immediately to the west by the bridge that carries the railway line into Fort William. 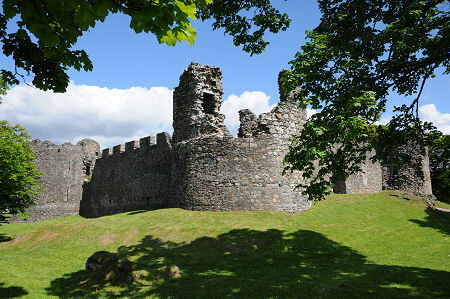 Those following the 73 mile Great Glen Way to Inverness will have started their walk in the Old Fort just a mile and a quarter to the south west and can visit Inverlochy Castle before crossing the river via the railway bridge. Inverlochy Castle stands in a position of great strategic significance at the south western end of the Great Glen. Whoever controls this location controls access to and from a large part of the western Highlands. Tradition has it that the importance of this site was first recognised by the Picts, who built a fortress here in the 600s that was later destroyed by the Vikings. This is consistent with archaeological evidence of earlier structures on the site, but what those structures actually are is as yet unknown. As you see it today, Inverlochy Castle comprises a (very) roughly square castle of enclosure, built in about 1280 as one of Scotland's first stone castles and remarkably unaltered since. 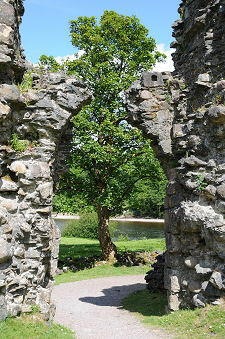 It is aligned with its main entrance on the south east wall and a secondary entrance on the north west wall, overlooking the River Lochy. At each corner is a circular tower. The largest of these is at the west corner and is known as Comyn's Tower. This served as a donjon or early form of keep and would have provided accommodation for the lord's private hall and, on the top floor, the lord's chamber and garderobe. The ground floor was used for secure storage. 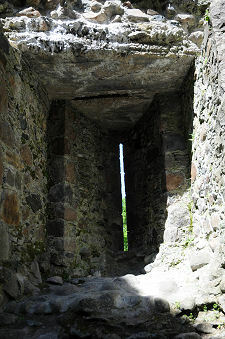 An especially striking feature of the Comyn Tower are the arrow slits, whose carefully angled construction gives a clear idea of just how thick the walls are when seen from the inside. 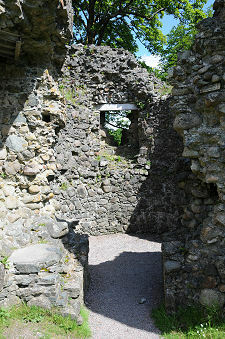 The other three towers provided limited accommodation, though their main role was to protect the corners of the castle, always the weakest part of the structure. What is now an open space within the castle measuring some 30m by 27m would originally have been partly occupied by ranges of buildings along the inside of the outer walls providing more accommodation and a great hall, plus services such as kitchens, a brewhouse and stables. The outer walls were topped with defensive wall walks and parapets. 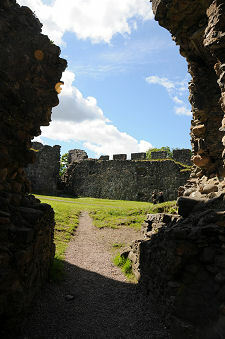 As originally built the castle would have been surrounded on three sides by a broad moat, connected to the River Lochy. The river provided protection on the fourth side and gave access to the castle from Loch Linnhe for the lord's (or anyone else's) birlinns, the traditional West Highland galleys used in the 1200s. There would originally have been a harbour on this side of the castle, partly protected by the castle's north west wall and the towers on this side. On the south east side, there are the remains of an outer wall running along the outside of the moat which terminates in small corner turrets and gives access to the site through an outer gate leading to what would originally have been a crossing over the moat. The Castle was built by John III Comyn, Lord of Badenoch, a rival of Robert the Bruce for the Scottish crown. Tensions between the two led to a naval battle in the River Lochy in 1297 between Comyn's supporters and MacDonald followers of Robert the Bruce, in which two ships were sunk. On 10 February 1306 Comyn was murdered by Robert the Bruce in the Church of the Grey Friars in Dumfries. Robert the Bruce subsequently became King Robert I of Scotland, and in a move to secure his hold on power, he suppressed the Comyn family, stripping them of their lands and properties, including Inverlochy Castle, which appears to have fallen into disuse after 1308, only some three decades after its construction. 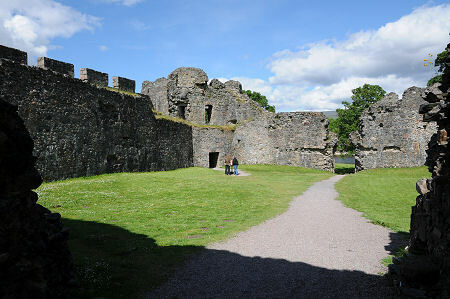 The castle probably looked much as it does today when, in September 1431, it became the focal point for the first Battle of Inverlochy. 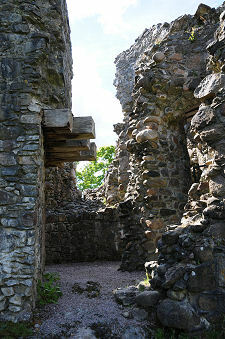 The background to the battle was the imprisonment by James I of Scotland of Alexander of Islay, 3rd Lord of the Isles. In Alexander's enforced absence, James I sent Alexander Stewart, Earl of Mar to gain control of lands still owing allegiance to the Lords of the Isles. The royalist army came face to face with forces led by Alexander's kinsmen Donald Balloch and Alisdair Carrach at Inverlochy, and the outcome was a costly defeat for the Earl of Mar in which he lost some 900 men compared with his opponents' 30. In 1506 the castle was granted by King James IV to the Earl of Huntly, better known for his association with Huntly Castle. Although the grant was conditional on Inverlochy being restored for use as a Royal castle, the Gordons seem to have made few major changes to the structure, which in no small measure helps explain its remarkably unaltered condition today. The second Battle of Inverlochy took place on 2 February 1645. A royalist army of some 1,500 Highlanders and Irish under the command of the Marquis of Montrose marched through the winter mountains and surprised an army of 3,000 Covenanters under the Earl of Argyll encamped at Inverlochy. The second battle was nearly as one-sided as its predecessor, 214 years earlier. Montrose lost just 250 men compared with some 1,500 killed on the losing side (see our Historical Timeline). In the 1800s Inverlochy Castle was purchased by the Scarlett family, who subsequently built the "new" Inverlochy Castle a little further north. They made cosmetic improvements to this Inverlochy Castle prior to a Royal Visit by Queen Victoria in 1873, and then it subsequently passed into the care of the state. It is now looked after by Historic Environment Scotland. Inverlochy Castle is located just west of the A82 a mile and a half north of Fort William.